If you’re looking for a quick fix to spruce up your kitchen or bath, check out my previous post, Part I of this series. For information on saving energy and water with new appliances and cool gadgets, click here to see Part II. In the remaining posts for this series, I’ll delve into options for more substantial replacement items such as countertops, cabinetry and flooring. It’s getting easier to integrate some of the many greener options that will modernize your kitchen or bath with style. Recycled paper countertops such as PaperStone, EcoTop, Richlite, Shektastone are very durable and resist water, stains and scratches. They’ll help you maintain good indoor air quality too, as they do not offgas toxic chemicals into your home. Butcherblock countertops made from bamboo, FSC-certified wood or reclaimed wood will add instant warmth and appeal to any kitchen. 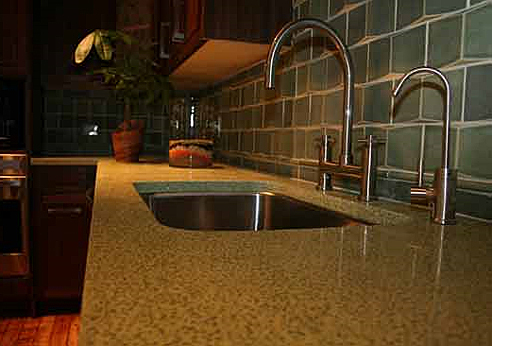 Recycled glass mixed with concrete or other binding agents creates surfaces similar to granite and quartz. Available in a wide range of colors and styles, these colorful countertops are sure to jazz up your kitchen or bath. Another good green option is those countertops made from recycled metal shavings, like those by Alkemi.